Trying to sell something, people come up with plenty of marketing techniques. These days, the methods are becoming more sophisticated. So, how to make sure that the strategy will truly work? Speaking of the real estate business, a fast website with detail information about the immovables, and the convenient navigation is beyond all requirements of the tough marketing world. 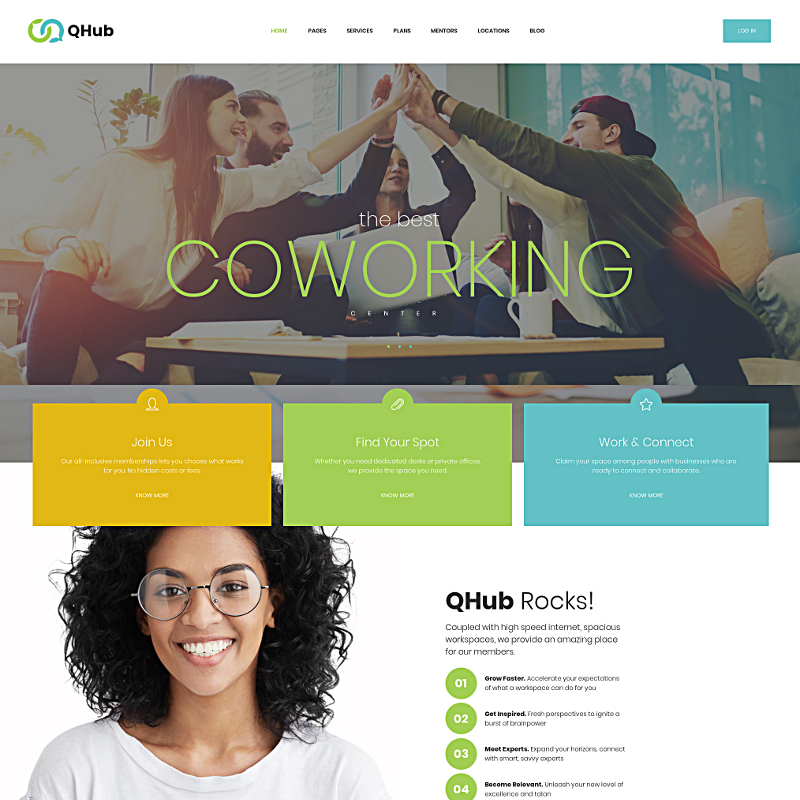 In order to present your company and take care of your customers (which is, undoubtedly, a hallmark of the reputable and high-performing company), it is crucial to create an outstanding website. Indeed, an appealing and modern website and its interaction with the well-developed social media channels increase brand awareness. Furthermore, an effective website answers the questions of the potential clients and acts as a binding element between a seller and a customer. In other words, a top-notch website is a must-have for a real estate company. Another question appears when an owner of the company has to deal with a website creation on practice. In this case, there are several solutions. Firstly, you can apply to a web design agency or hire a freelancer. The specialist will take into account your preferences, then take money, and give away the work. Sounds like a nice solution, doesn’t it? Still, despite the fact that a website is done by experienced web designers (which is not always true), this solution has a couple of drawbacks – namely the high price and, in some cases, discrepancy with expectations. Gradually, we came closer to the second solution – you can create a website for a real estate company on your own. Regardless of how complicated it might seem on the surface, creating a website even without a substantial knowledge and experience is possible. 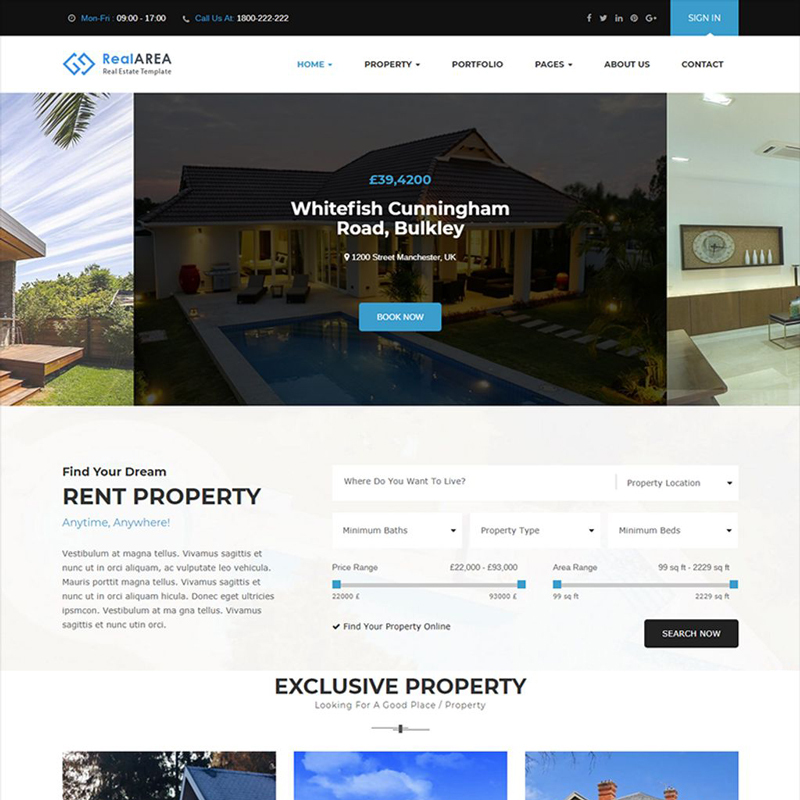 For this purpose, it is wise to use one of the dozens of awesome real estate WordPress themes. add appealing styling elements, plugins, and widgets. The collection of WordPress ready-made solutions is wide indeed. Still, we managed to choose the top 20 real estate themes that particularly deserve your attention. This 5-star WordPress theme is built on a Unyson framework with its own drag and drop builder with a stunning functional. For instance, it is possible to organize content in multiple ways and move the sections along the page until the most appealing structure is reached. Furthermore, it goes along with useful plugins such as Booking Appointment or Event Calendar. In order to present the real estate objects, you can create a Gallery. Google Fonts and FontsAwesome icons. Homelist was carefully designed and coded exactly to meet the requirements of real estate agencies, agents and property owners. With its help, dealing with a technical side of presenting the services is not that big of a deal. 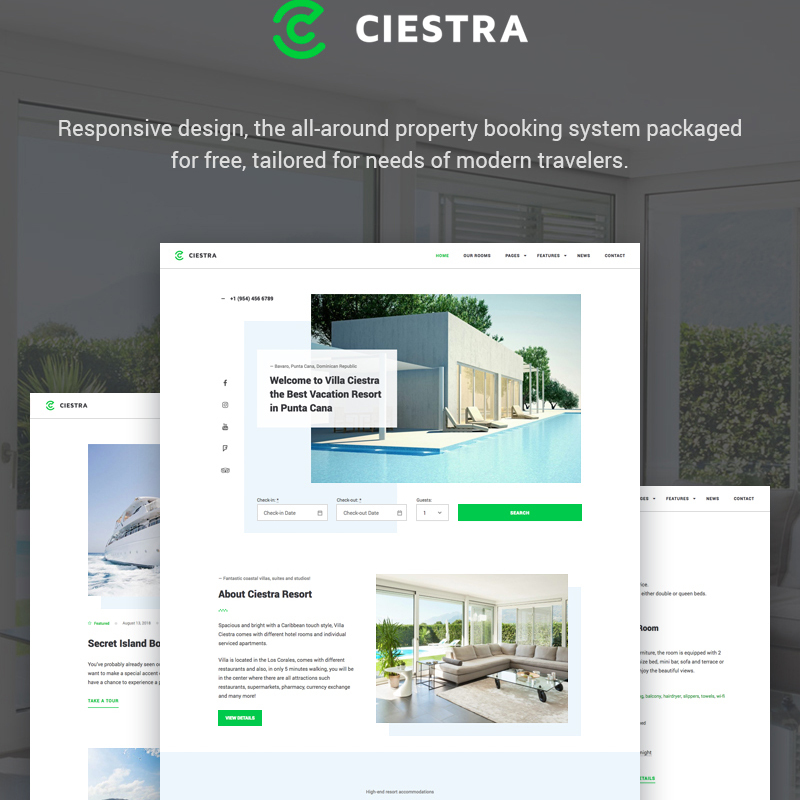 For instance, the theme includes Agency or Agent, Package, Properties Lists, Slider, Search, Submission, Edit, Client’s Carousel, and other widgets such as Mortgage Calculator. Moreover, it has a rich collection of custom posts types and single pages. The choice of web forms is also wide. 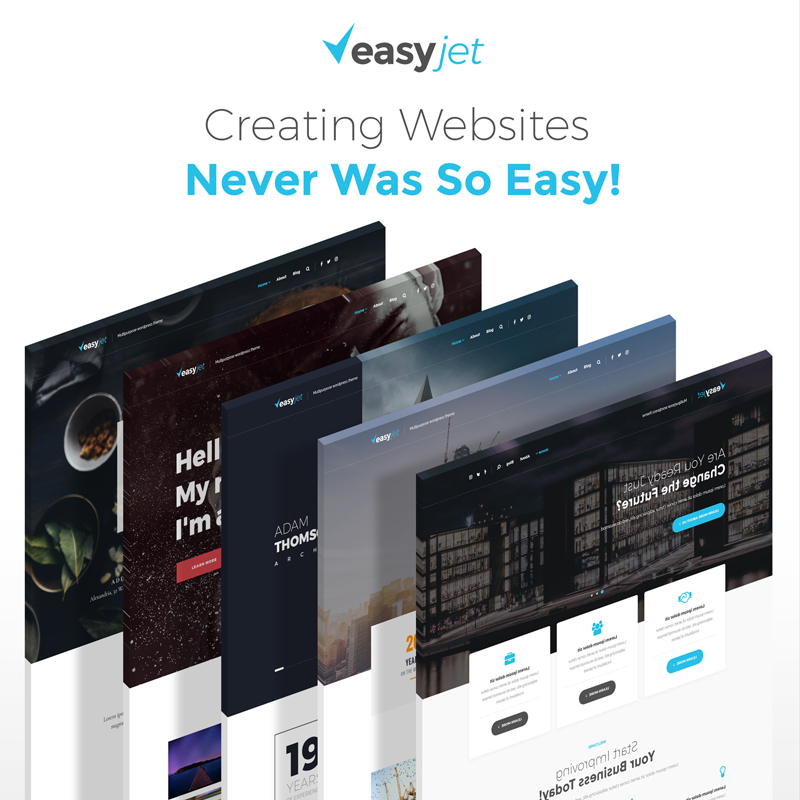 This multipurpose solution is built with an Elementor page builder which enables a full-fledged functional for web building due to its powerful JetPack. With its help, for instance, it is possible to structure content in blocks, add animated elements, sliders, and popups, etc. 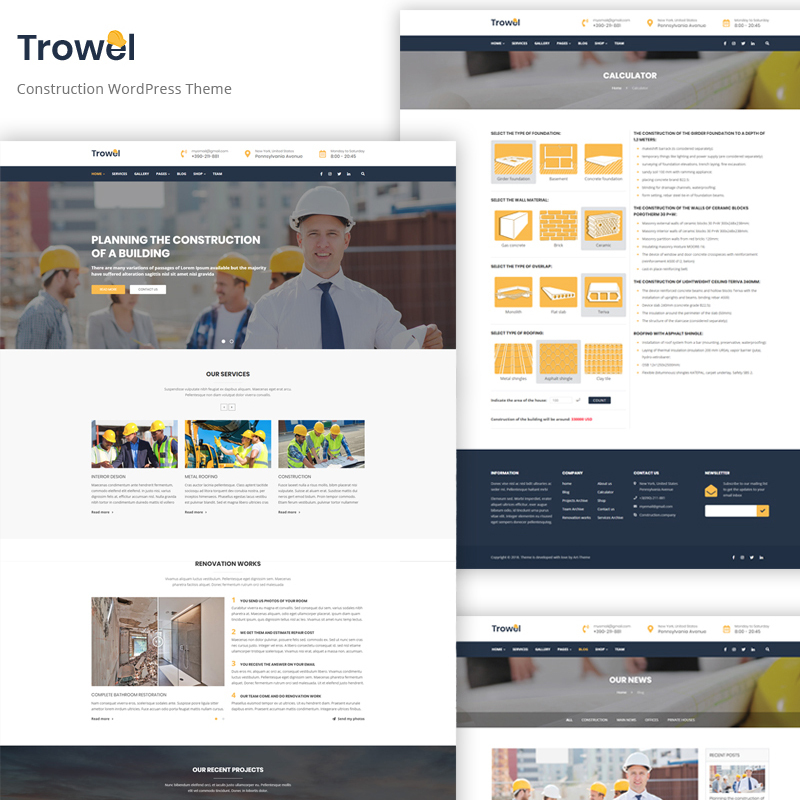 By the way, there is a great collection of other WordPress business themes on the TemplateMonster market where you might also find something to your taste. An installation process takes a couple of minutes. Plus, with the help of Cherry Wizard plugin all needed plugins will be installed in a couple of clicks. Sidebar manager and Dropdown menu. 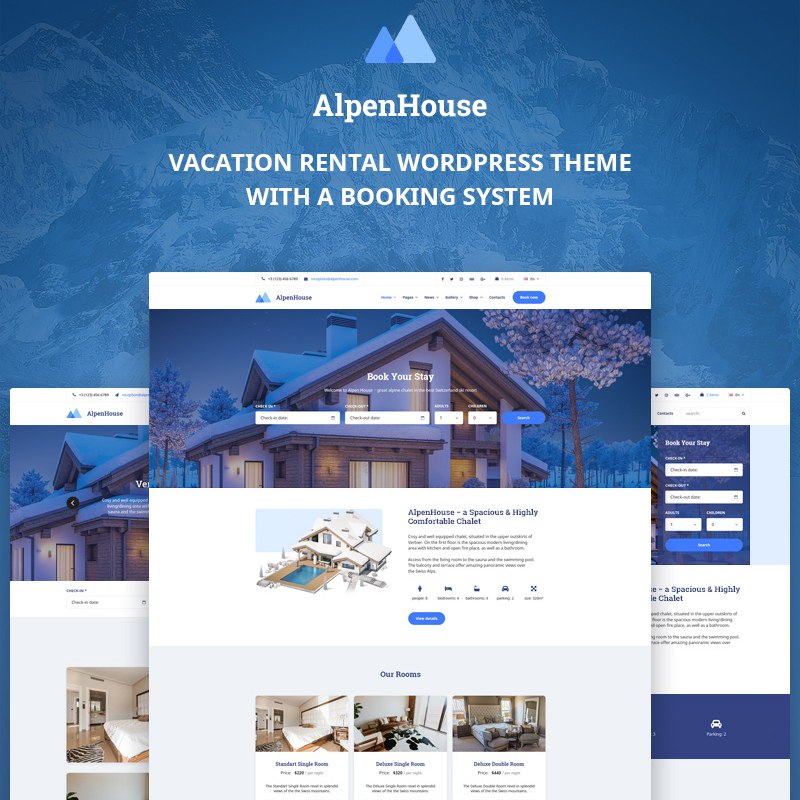 If you rent any kind of a hotel, guest house, resort residence, chalet, cabin, inn, or any other type of immovables, AlpenHouse is a good fit. This MotoPress WordPress product is built with an Elementor and offers a powerful collection of plugins and widgets. For instance, it comes along with an ultimate reservation toolkit, built-in international payment gateways, and pre-built modules for various purposes. Furthermore, you can choose among different page (grid and full-width) and blog (Masonry and traditional). It contains 4 stunning header variations and image and video portfolios. A drag and drop nature of Power page builder make it possible to build pages fast using a rich collection of pre-designed page layouts and content modules. 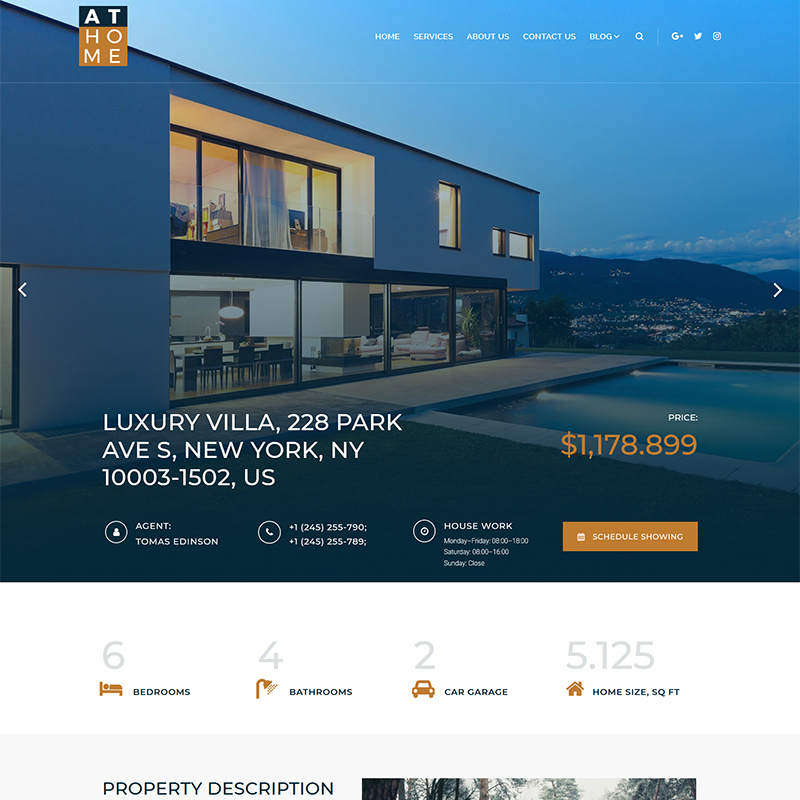 In addition, it includes a great number of custom widgets that will increase the UX of the real estate website. For example, you can use a Simple Slider to draw attention to certain services or deals. Moreover, you can implement an advanced search to make navigation on the website more convenient. By the way, with a dsIDXpress plugin, you will integrate real estate listings from the MLS database into the website easily. Coming up with the most popular plugins such as Visual Composer, Revolution Slider, and WooCommerce, this multipurpose solution stands out of many other competitors. A powerful toolkit of styling options and 9+ home page variations make it possible to create an attention-grabbing website. In addition, you can create a Gallery or launch a blog in a couple of clicks. 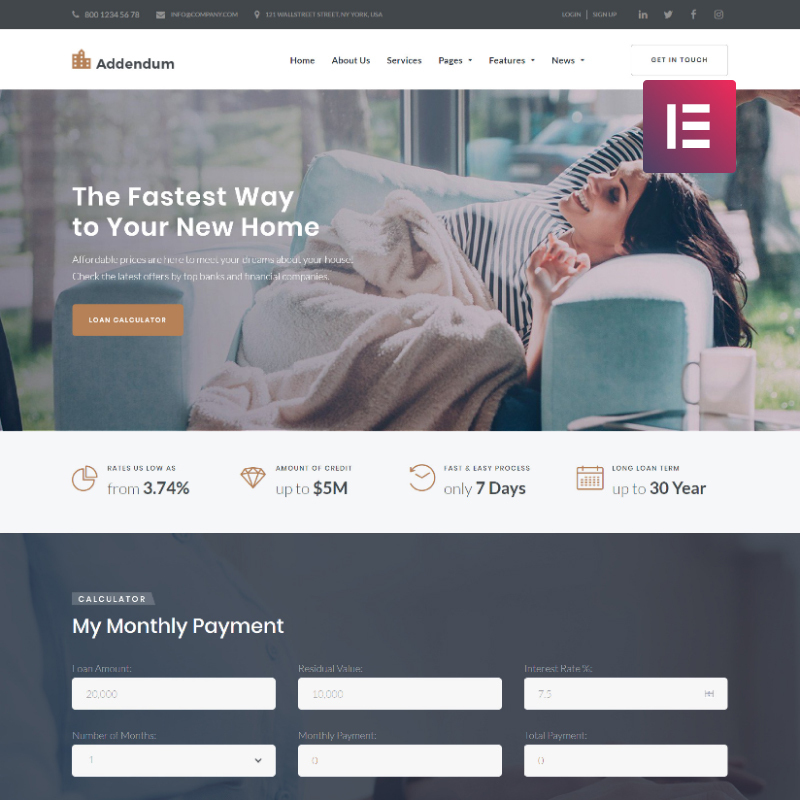 Addendum is built with an Elementor, which automatically guarantees a full-fledged functional for drag and drop web building and design. For instance, you can organize content into multiple blocks and place them freely wherever you want. Plus, JetElements includes additional modules that will enable a unique look of the website. In order to make navigation through the website as convenient as possible, you can set up a MegaMenu. A gallery with high-quality images will be a valuable addition to the website. 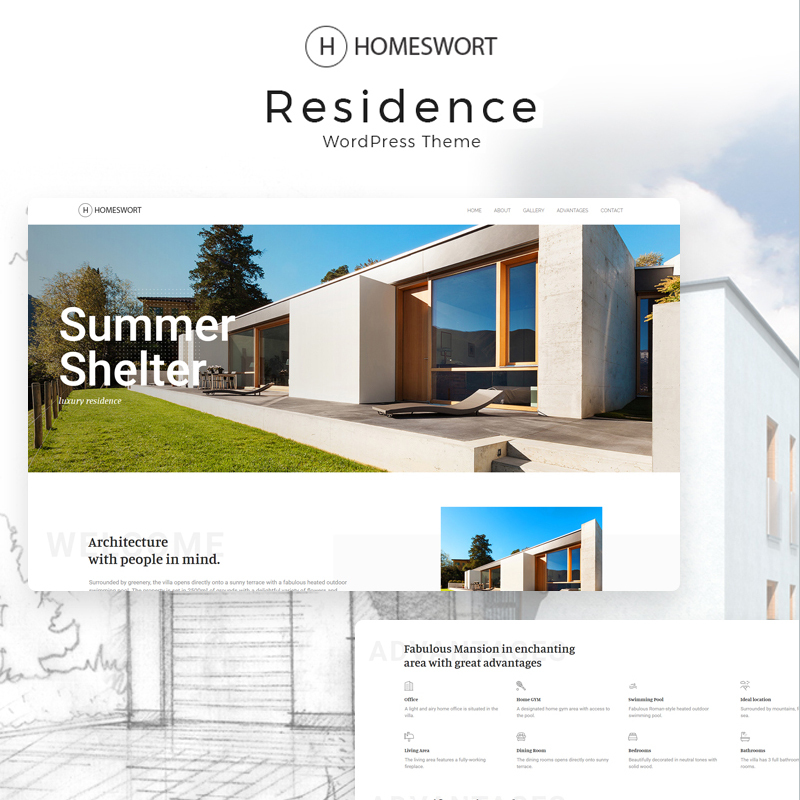 Homeswort is a luxury real estate WordPress theme with a stunning minimalistic design and a bunch of relevant trendy styling elements. A splendid Parallax effect makes content appear smoothly gradually attracting attention to certain sections. A customizable header is another attention-grabbing element with a powerful effect. As a rule, Elementor page builder functional allows making any changes in a matter of a couple of clicks. Here is another ready-made solution for a real estate website with a drag and drop functionality. In a couple of clicks, it is possible to add an awesome header to spread a word about the company and attract customer’s attention. Plus, it is easy to present information about the services organizing content in blocks and creating a gallery. In order to inspire trust among new customers, you can share information about the previous ones, namely their testimonials. Without any substantial knowledge, even beginning users will manage to launch a special offer. 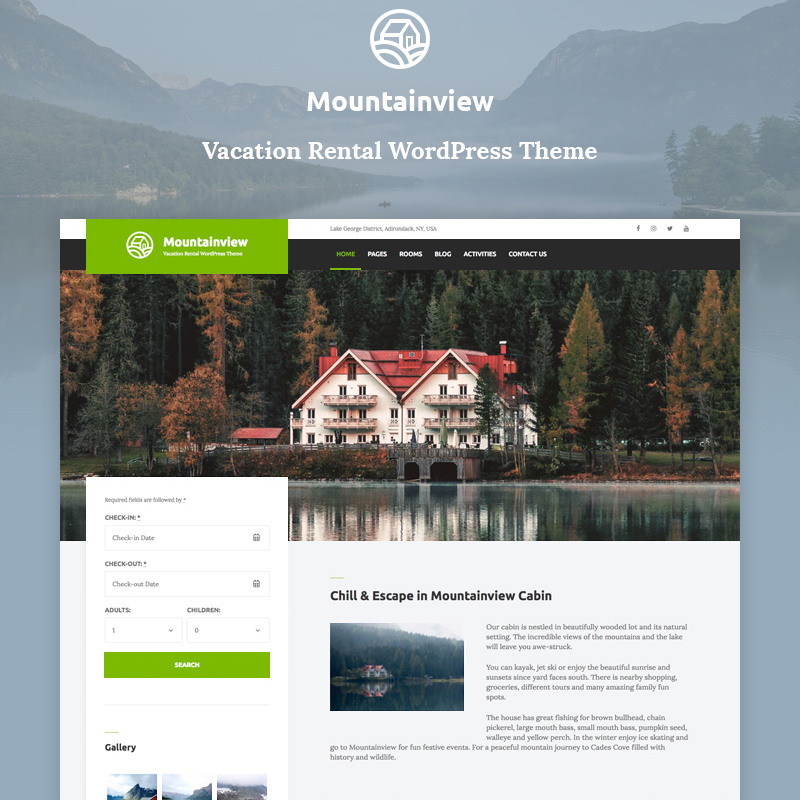 If you deal with vacation business, this theme is going to be a good fit for a future website. It offers a convenient reservation system popular payment gateways for direct bookings, web forms, etc. Furthermore, you can choose among multiple pages and posts layouts (full width or grid, with or without sidebar), different header and footer options, widgets, galleries, etc. In other words, the nature of the page builder enables web building and designing even without skills of coding. 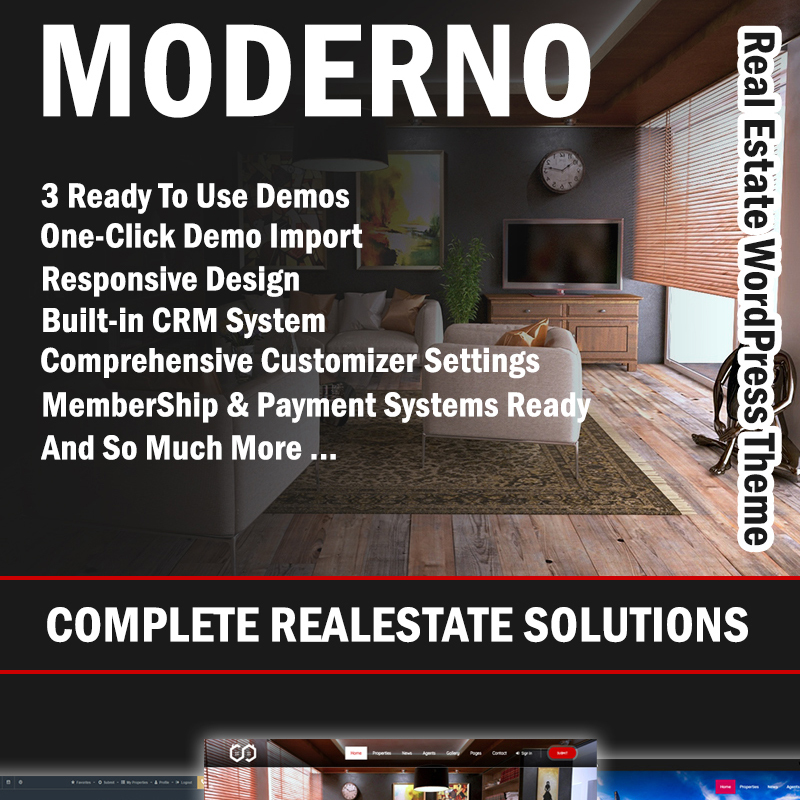 With Moderno theme, it is easy to build and design Single Property Page and Properties Cards. In addition, you can add such useful categories as Compare Properties or Favorite Properties to make the visitor’s presence on the website more convenient. Along with the main theme, a child theme and three demos are included. Adding a Revolution Slider to the main page will create a unique look of the page. 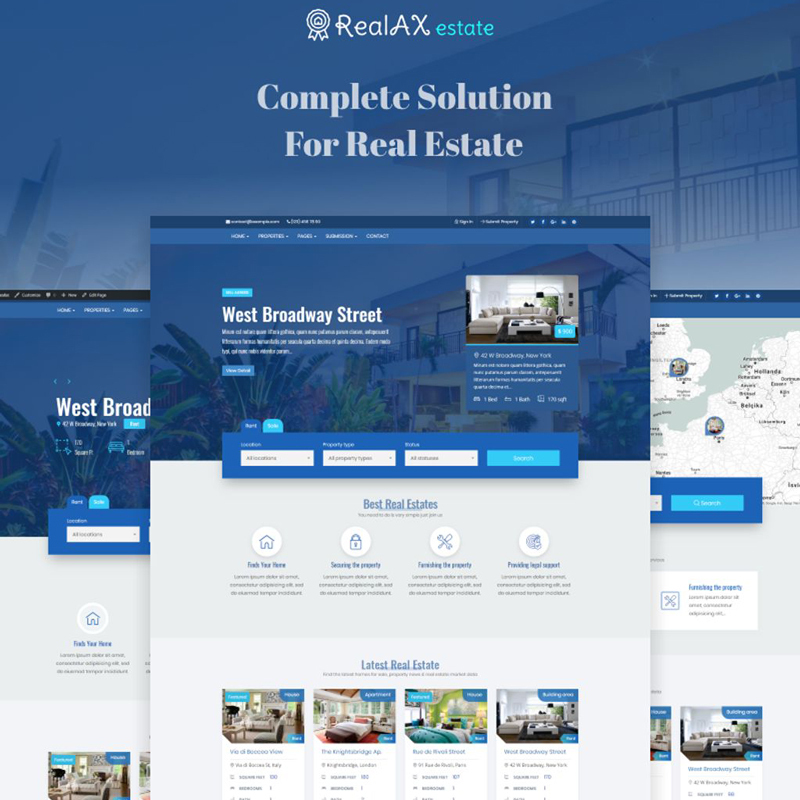 This Retina ready WordPress theme with MegaMenu, 4 blog layouts, different header and footer layouts, Google Fonts, and other features will become a good suit for a real estate website. 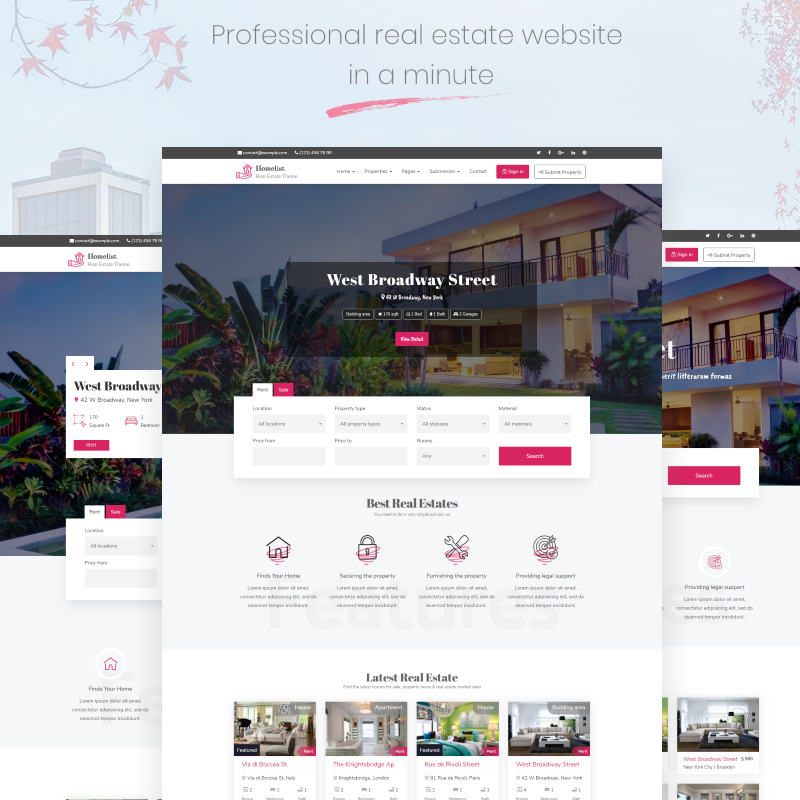 Real estate agents, brokers, agencies, organizations might sleep well because a website created with this theme is bound to succeed. In order to stay tuned with a real estate market, it has a trustworthy management system (MLS). Another advantage of the theme is its advanced search that the customers will more likely to find convenient. In addition, it is possible to choose among 17+ pre-designed home pages. 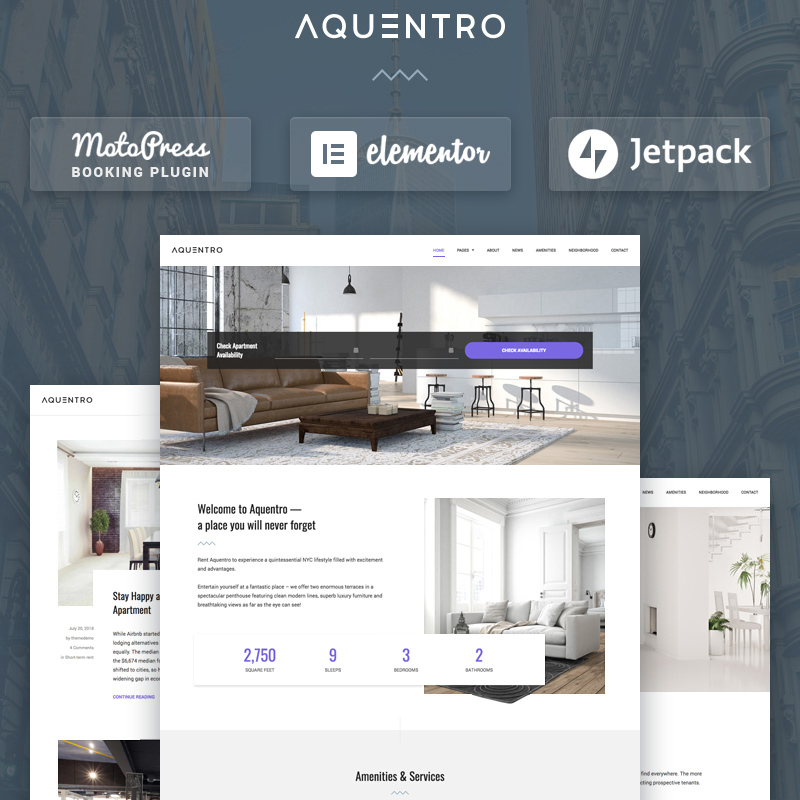 Aquentro is built with an Elementor page builder and is stuffed with a MotoPress booking plugin to enrich the functionality for a web building and design. It will also sync automatically all bookings from all external channels that support iCalendar with a website. Moreover, it has two-page layouts (full-width and grid), customizable navigation menus, two widget areas. 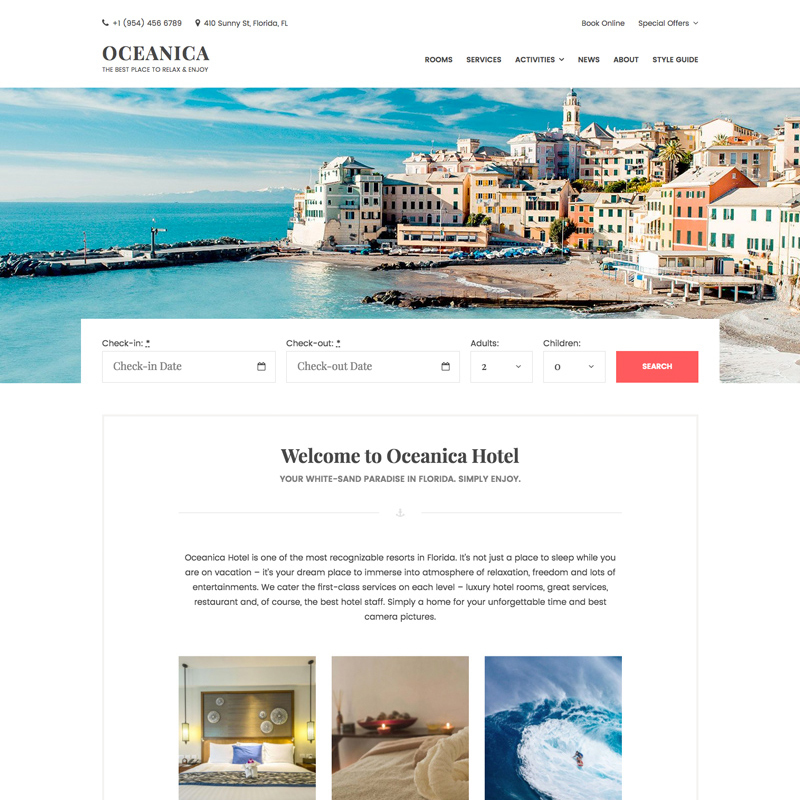 Along with a breathtaking design that sets the visitors up to a vacation mood, Oceanica is stuffed with an advanced booking system that enables blocking dates, manual or automatic booking confirmation modes, channel manager for booking, etc. Another advantage of the theme is a flexible platform for making online and offline payments, present discounts, etc. Just imagine that your potential customers will visit a website and see a stunning full-screen slider, search for the needed services with advanced home search, check out the experience of the previous clients in the testimonials, and navigate easily through the website due to its intuitive navigation and convenient menu. For the record, all this (and even more) is possible with RealAX theme as it offers great technical functionality. 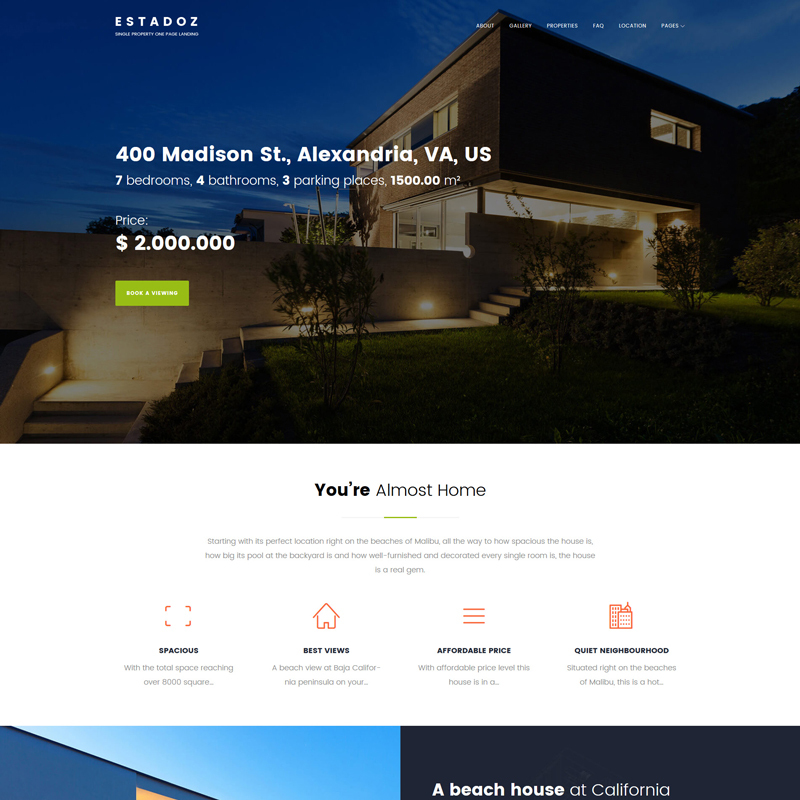 As a rule, Elementor page builder offers tempting options for creating a top-notch unique website for a real estate company. Furthermore, synchronization with external travel platforms such as Booking or Airbnb is available with iCalendar. A flexible payment system is another substantial advantage of the theme. With the help of the beautiful galleries and slideshows, you will present your services in the most appealing way. Simple and advanced booking will create a positive UX on your website. 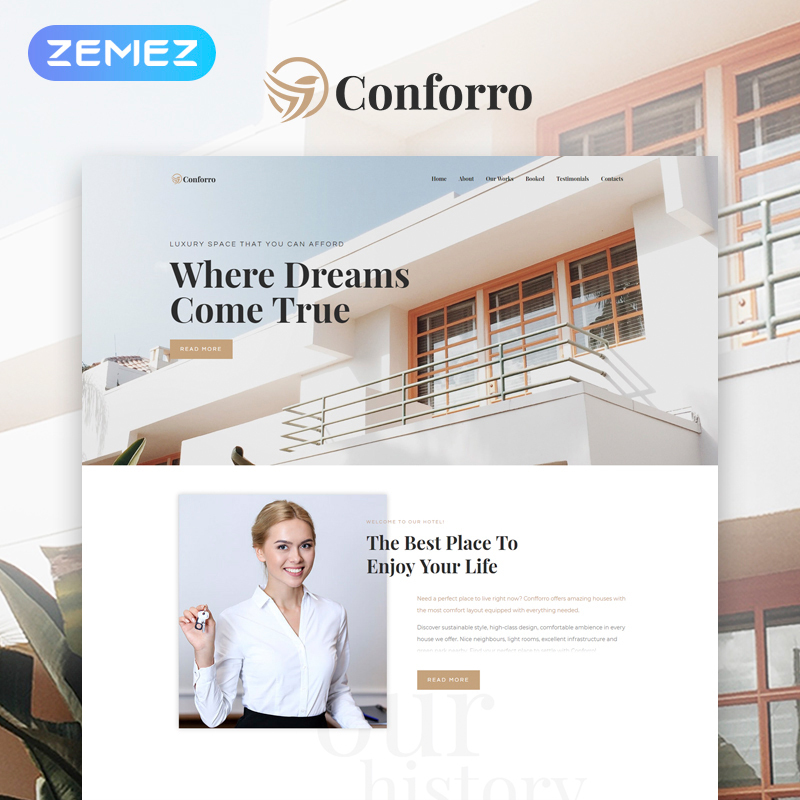 If you look for a stylish minimalistic design and strive for a sophistic look of the website, then Conforro has much to offer for you. A responsive theme is pretty easy to customize – you can add, edit, and remove almost all elements. A rich collection of widgets enables a great functionality of the website. 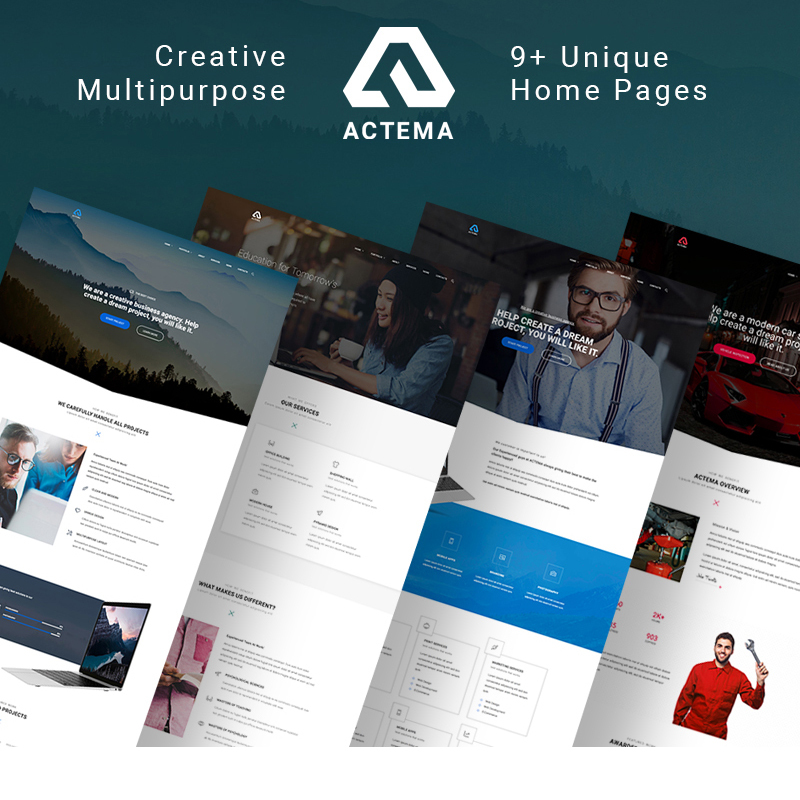 With this theme, you will create pages in a matter of minutes as it is built with Power Builder, 25+ modules, a rich library of presets, and drag and drop nature. 30+ content modules, pre-built header and footer styles, and other options that Power page builder enables are included in this awesome ready-made solution for WordPress. 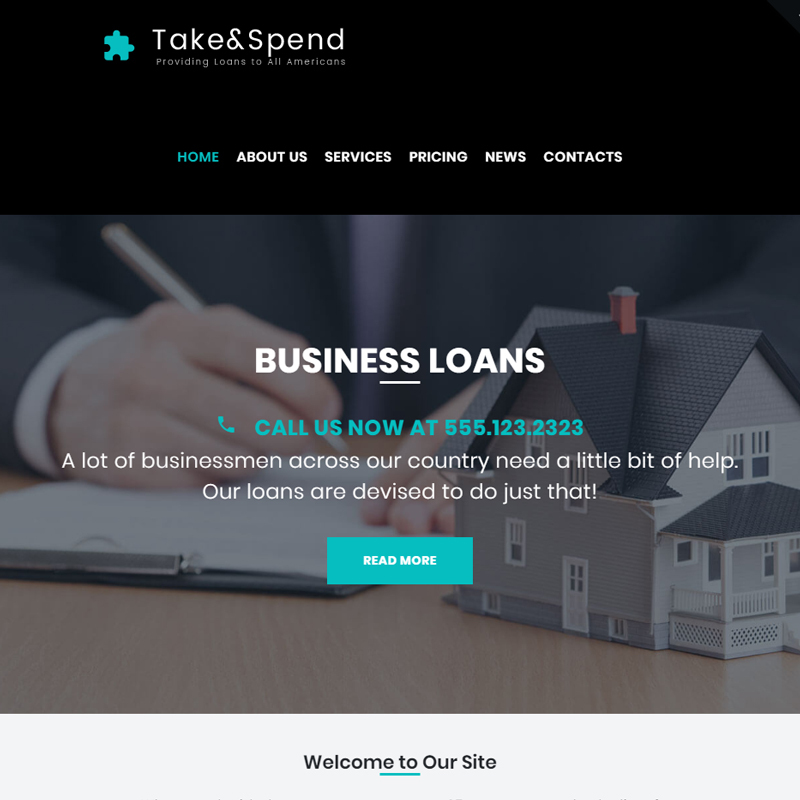 This theme is suitable for both those, who deal with finances and those, who are involved in real estate business. 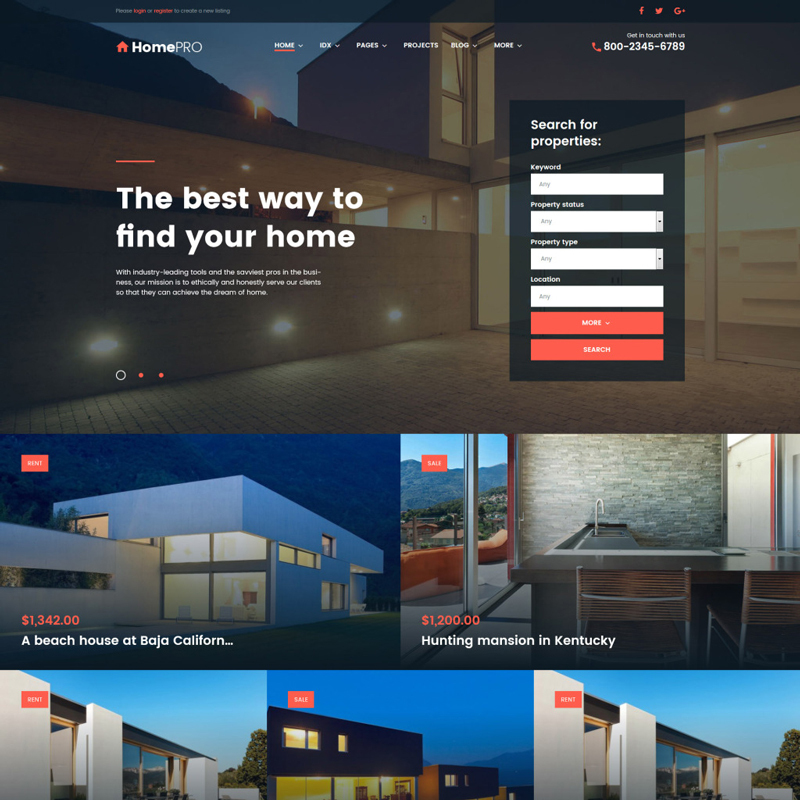 Gradually, we reached the end of the collection with 20 WordPress real estate themes that deserve particular attention. The good news is that everybody (even without knowledge of coding) can create and design a website. The bad news is that it is not enough for an effective online presence. After creating a website, it is crucial to brainstorm an effective marketing strategy that will help the website occupy leading positions among search engine results and human’s ratings. Fortunately, most of the themes are already equipped with powerful tools for efficient marketing and are already optimized for search engines and for speed.